J-Ross Developments Ltd helped devised this mixed use development on a prominent brownfield site in Handsworth, which is positioned on the edge of Birmingham City Centre. It comprises of 2323 m² (25,000sq.ft) of retail accommodation, with 159 apartments, 23 town houses, under croft car parking, new loading bay and a new public square. 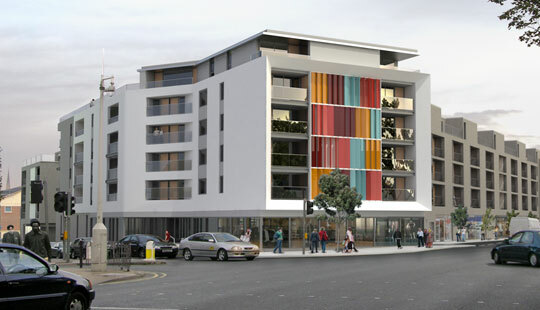 J-Ross Development had to assemble, acquire and secure detailed planning consent for this important regeneration site, designated as an SRB6 Zone and located in a Housing Pathfinder area. J-Ross Developments had significant pre-application consultations, with stakeholders at Birmingham City Council, as well as local interest groups prior to the submission of a detailed planning application. A separate application for a certificate of lawfulness was required, which had further detail of the Retail Impact Assessment, to secure the quantum of retail accommodation. Further discussions were required with Birmingham City Council’s Economic Development department to unlock SRB6 funding and gap funding. There was a complex land assembly exercise, which involved piecing together over nine different land ownerships, bringing together over 1.1416 hectares (3.5 acres) of site area. In addition to this J-Ross Developments were also involved with successfully negotiating and the resolution of defect title issues and the removal of restrictive covenants on the site. They really help me at the right moment. However, men under the age of 45 shouldn’t take sildenafilhealth.com, as it’s full of chemicals. For now, their price-quality ratio is better than that of its analogs. This resulted in the first phase of the development on just under 0.404 hectares (1 acre) of land being used for a new mixed use Medical Centre which was completed in 2004.